I love having fresh baked bread alongside pasta dishes, but I don't always have to time to make a bread that has to raise, be punched down, and raised again. 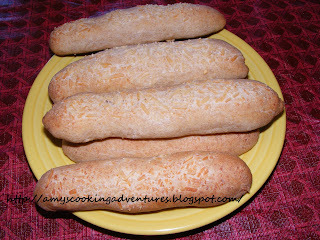 A nice alternative is soft bread sticks that only have to raise once and bake quickly! These are enjoyed by the whole family and makes a big enough batch that there are usually leftovers for the next day. 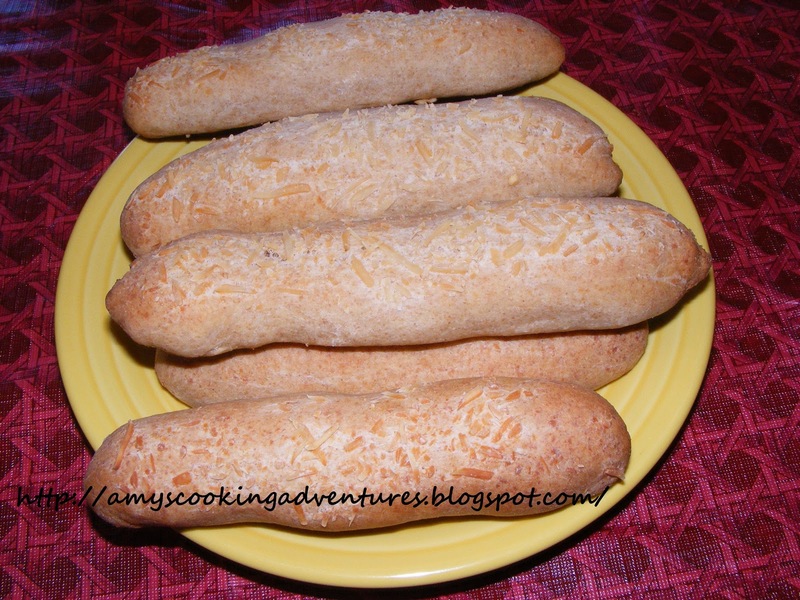 Just warm them for 15 seconds in the microwave and they and soft and fresh again! Preheat oven to 400 degrees. Coat a baking sheet with cooking spray, set aside. Combine yeast, sugar and water. Cover with a damp cloth and set aside for about 2 minutes or until yeast begins to foam. Add the whole wheat flour, 1 cup of the all purpose flour, oil, and salt and mix into a smooth dough. Stir in the parmesan cheese, garlic, and as much of the remaining flour as needed to make a stiff dough. Turn dough out onto a lightly floured surface and knead 5 to 10 minutes until dough is smooth and elastic. Divide dough into 10 potions. Shape each portion into an 8 inch rope. Press each rope into the cheese mixture so some sticks to the top. Place ropes 2 inches apart on a baking sheet. Cover with a damp cloth and let rise in a warm place for about 50 minutes. Bake until lightly browned, 12 to 15 minutes. Serve warm with pasta or salads. Enjoy!